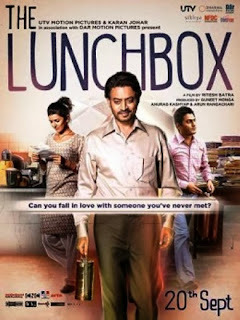 The Lunchbox - Can you fall in love with someone you have never met? This has been the tagline of this movie. Though the answer for the question could be 'Yes'; this tag does not fit for this movie at all. Performances - Laudable, Screenplay - Good; but the Interpretation - Abstract and the end of Story - Abrupt. A wife and a mother of an eight year old girl, thinking more of a stranger; while her husband struggles with same menu for lunch daily to an extent that it affects his health. And probably to avoid which, would have shared lunch-time with someone, which the wife suspects as a betrayal and decides to leave him! A government officer and a widower, in his last month of service; committing mistakes to dent his unblotted service of 35 years and unmatched loyalty for wife! Moreover, an allegation on ISO certified Dabbawala service which is close to six-sigma standards! Rightly so, it is not selected as India's submission for Oscars. I would say, Film Federation of India (FFI) did take the good road by selecting 'The Good Road' instead. Nevertheless, this lunchbox though not stomach filling, is better than other so-called creative out-comes like 'Kai Po Che', 'The Attacks of 26/11', 'Madras Cafe' et al; which in my view do no good to the society at all. Potugadu - Surprisingly acceptable and appreciable effort with a touch sentiment and some catchy songs. A better film for the lead actor in comparison with his earlier attempts. Simple formula for a dimple hero - a song with each actress, a bit super-human fights, a little comic tonic, some twist in tale and in the end, all is well. Story revolving around love and to know-how, check a show.